Wild Kerry is a small eco-tourism business specialising in showing people the wild places of County Kerry in Ireland where the guidebooks do not go. Wild Kerry aims to show people the hidden beauty of County Kerry and the unique ecology that can be found here. It is run by professional ecologist Moss O’Connor from Annascaul. Moss, with the help of other wildlife professionals, takes groups and individuals on tours of special places in Kerry and describes the unique habitats and species that live within these habitats in a friendly and easy to understand fashion. The length of the tours depends on the enthusiasm of the group and there is no rush to get finished. All tours are conducted at a leisurely pace and there is something to suit all levels. The amazing archaeology and geology of the Kerry region are of special interest to Wild Kerry and we love showing people the uniqueness of our county. Specialist wildlife watching can also be arranged. Based in his workshop and studio in the village of Annascaul on the Dingle Peninsula, Co. Kerry, Zac Phelan designs, hand makes and hand decorates his range of individually crafted ceramics. Annascaul Irish pottery is hand thrown and each piece is individually glazed and decorated using unique colours and designs. Zac’s pottery compliments the modern home while holding on to the traditional virtues of elegance and functionality. Fungie is Ireland’s most famous wild bottlenose dolphin. The boats leave Dingle Pier at regular intervals during the day, every day, all year round (weather permitting) on a 1 hour trip to see Fungie wild and free in his natural habitat. Experience the fascinating Underwater World of the Atlantic at the Dingle Oceanworld Aquarium.Polar Penguin Display featuring Gentoo Penguins, Sandtiger Sharks, Amazonian Displays, Touch Tank, 9m Underwater Tunnel and much more! 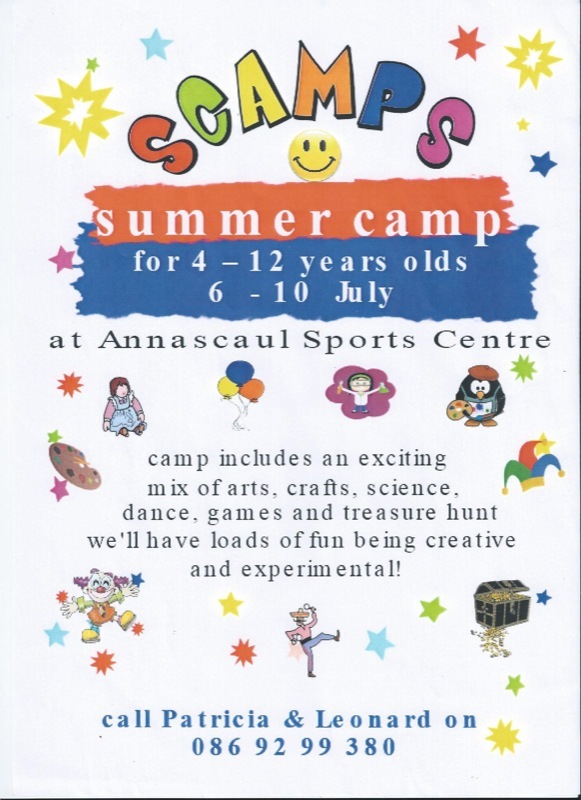 For 4-12 year olds at Annascaul Sports Centre.